That's the approach Jeff Bezos' space company, Blue Origin, is taking to test its New Shepard, which launched and landed safely on Saturday. The launch in West Texas is the third for the New Shepard rocket, which is named after Alan Shepard, the first American to go to space. Both the rocket and the capsule, which will eventually carry paying customers, landed successfully. During this test, the capsule was carrying two microgravity experiments from the Southwest Research Institute and the University of Central Florida. The SRI contributed its "Box of Rocks Experiment" (BORE) -- a box of loose rocks that "mimic the surface conditions on asteroids." The second experiment, "Collisions Into Dust Experiment" (COLLIDE), involved a box of dust and a marble that "mimic impacts between objects in microgravity." Unlike other capsules, Blue Origin's is completely automated so no pilots are inside to control it -- this reduces risk of casualties and human error. The rocket will continue to be relaunched and landed in order to test and improve upon it. New Shepard had its first successful launch in April 2015 but because of issues with the hydraulic system, it wasn't recovered. It was launched again in November and January and successfully landed both times. The tests are part of an effort to reuse rockets instead of disposing of them after they've been used to launch space craft. This new approach would greatly lower the cost of space flight. 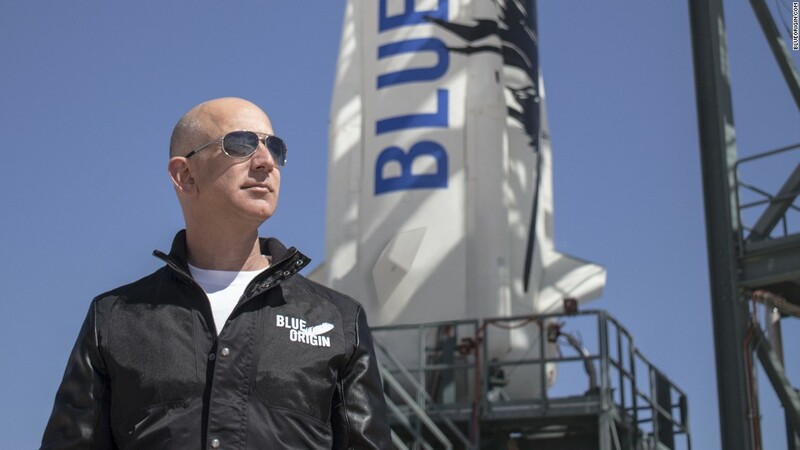 "Now safely tucked away at our launch site in West Texas is the rarest of beasts -- a used rocket," Bezos said after the first successful landing. "Full reuse is a game changer, and we can't wait to fuel up and fly again." Saturday's event was unique in that Blue Origin announced the test beforehand -- usually they're revealed after they've been completed. The launch and landing were captured by drone cameras, according to tweets from Bezos. The founder of Amazon (AMZN) tweeted the event and noted that the landing was "perfect." CNN's Rachel Crane contributed to this report.